Home › Physical health definition › Quit smoking - major diseases are caused by smoking cigarettes. Quit smoking. One of the causes of many life-threatening diseases is smoking. Cigarette smoking causes,initiates or promotes chronic obstructive pulmonary diseases (COPD), many types of cancers and cardiovascular Diseases. Even after quitting smoking, the risk of lung cancer may persist for more than 10 years. Cigarette smoke contains hundreds of toxic chemicals. It also contains nearly 70 carcinogens (cause cancer), including arsenic, vinyl chloride and 1,3–butadiene. People usually start smoking cigarettes in their teens just for the heck of it or under peer pressure. How does smoking become an addiction? Cigarette smoking becomes an addiction in a very short period of time. Nicotine is the known addictive chemical in cigarettes. Search is still going on for finding other possible addictive substances in the cigarette. Nicotine, a naturally occurring chemical found in tobacco is as addictive as heroin or cocaine. Nicotine reaches the brain within seconds from the starting of smoking. Nicotine affects the chemistry of brain and the smoker develops physical and psychological dependence. However the effect wears off within a few minutes after putting out the cigarette. The withdrawal symptoms start and the craving for nicotine makes the person to light up again. Treating withdrawal symptoms is much easier than facing life-threatening diseases. 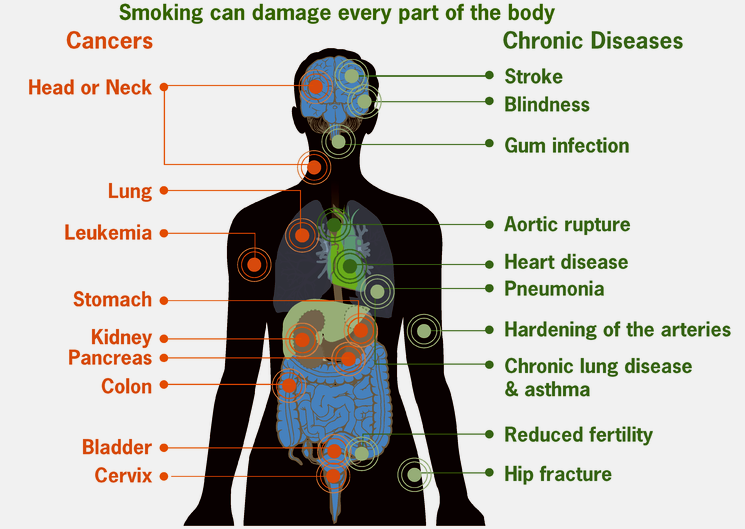 There is an awareness in the population that smoking can cause many health problems. Many still continue to light up cigarettes because they do not know the severity of the health hazards. Smoking cigarette does not just end you up with sore throat and cough. Several fatal and devastating diseases will be the outcome of this harmful habit. Smoking significantly increases the lifetime risk of developing cancer. The direct contact with carcinogenic chemicals in the cigarette, their fumes and heat from cigarette cause mutations in the genes and growth of malignant cells in the oral cavity. The cancers of the oral cavity, including those affecting lips, tongue, floor of the oral cavity, insides of the cheeks and gum, are common among the smoking population. These are diseases of the cardiovascular system which affect the heart and major and minor blood vessels. Nicotine in the cigarette increases the level of LDL (bad cholesterol) leading to clogging, narrowing and hardening of the arteries. The narrowing of arteries is atherosclerosis. Cigarette smoking can cause accumulation of degenerative material in the inner layer of arterial walls, known an atheroma. The deposits in the blood vessels can narrow down and close the passage altogether and the disease is known as thrombosis. The clogged blood vessels can affect the individual's function depending upon the blood vessel involved and the degree of obstruction. Arterial thrombosis, the formation of a thrombus in an artery, and atheroma can cause diseases like coronary thrombosis, cerebral thrombosis, myocardial infarction (heart attack), stroke, abdominal aortic aneurysm and pulmonary embolism. Thrombosis can affect the veins. Venous thrombosis affecting deep veins (femoral veins), portal veins, renal veins, jugular veins, hepatic vein, subclavian vein and dural venous sinuses may cause many vascular diseases. This harmful habit causes many non cancerous diseases of the respiratory system. The fumes from the burning cigarette can irritate the lining of the lungs and can damage alveoli (air sacs). The fumes also kill the the cilia, hair-like structures present in the lining of the trachea which are involved in the cleaning of the air passage. The air passages may also narrow down due to thickening of the passages and accumulation of mucus. Lung function also gets regressed and hampered by smoking cigarettes. Chronic obstructive pulmonary disease (COPD), chronic cough, chronic bronchitis and emphysema (a degenerative disease) develop and progress into severity. About 50% of the people diagnosed with COPD die within ten years. Nicotine, toxic fumes and other chemicals inhaled by the mother get passed on to the fetus through placenta and cause decreased fetal growth, premature births, abruptio placentae (placental abruption) and low birth weight. Maternal cigarette smoking is found to have caused miscarriages, stillbirths and death of the baby during birth. Nursing mothers addicted to this habit can pass on harmful chemicals to the infants. It also found that maternal cigarette use can contribute to sudden infant death syndrome. Smoking cigarettes causes erectile dysfunction (impotence) as the blood vessels get narrowed and sufficient blood supply is not maintained for erection. When one or both the parents are habituated to cigarette smoking, other nonsmoking members in the family undergo passive smoking. The family members, especially children are affected with respiratory diseases. They may also be affected by the fatal diseases, depending upon the amount and frequency of inhaled fumes. This harmful habit also increases the risk factor for developing autoimmune diseases, type 2 diabetes, osteoporosis and loss of bone mass. Bedroom and quality of sleep. How much sleep do children need. Image author: Bionerd | License: CC BY 3.0. On a diet and starving. 1.Prabhat Jha, Richard Peto. Global Effects of Smoking, of Quitting, and of Taxing Tobacco. N Engl J Med 2014; 370:60-68 January, 2014. 2.Joshi V, Matthews C, Aspiras M, de Jager M, Ward M, Kumar P. Smoking decreases structural and functional resilience in the subgingival ecosystem. J Clin Periodontol. 2014 Aug 19. doi: 10.1111/jcpe.12300. 3.Kalucka S. Consequences of passive smoking in home environment. Przegl Lek. 2007;64(10):632-41. Current topic in health and fitness tips: major diseases are caused by smoking cigarettes.